Please plan to visit the library and choose a free book for your child’s home library. We will have a large selection of children’s books to pick from! Special thanks to the “Friends of the Library” who generously donated these books! We will also have stickers, and bookmarks for the children. Story Times will feature books by many of our favorite author’s! Please join us for the fun! Ivy Green Rebekah Lodge #36 is hosting a Harry Potter “Hogwarts Banquet” at the historic Odd Fellows Hall is Epsom on Saturday, May 5th 6pm. The event will feature a “Harry Potter” inspired buffet and special activities including a potions making station etc. Guests are encouraged to dress up as their favorite character. Proceeds from this event will be used to continue our local outreach projects. Reservations are required and the event is for ages 8 and up. Tickets are $10.00. Call Vickie at 736-4707/496-1877 for tickets. This week, my committee heard the last three Senate bills. SB 386, access to criminal records, allowed someone to submit an electronic hand scan for record purposes without having to have the request notarized – which is the only remaining paper step in the process! Requests sent by mail still need to be notarized, to confirm identity, but that’s not needed if the subject comes in person to get a hand scan. We immediately voted, 15-0, to recommend the bill to pass. SB 477, establishing a therapeutic cannabis medical oversight board, is a new organization to review the effectiveness of different types of medical marijuana, and its effects on different conditions. It consists of ten medical providers, a patient, a representative of the treatment centers, and the medical director for the state health & human services department. Since they would all be volunteers, we’re likely to recommend it. SB 535, licensing art therapists, was a continuation of last week’s hearing. We learned that art therapists are usually some sort of mental health councilor as well as a specialist in art therapy, and they need a license in order to bill third party payers (insurance companies, Medicare, Medicaid, …) I’m not convinced that the state should set up another new board for a profession that overlaps so significantly with others, but I expect we’ll pass it regardless. We voted, 16-0, to recommend SB 323, which reinstated a preference for laid-off state workers that had been left out of the budget this year. Subcommittees met on several of our more contentious bills; I worked out a compromise amendment to SB 334 that all the stakeholders were willing to live with, however reluctantly. Writing this letter is long overdue. I want to start by apologizing for not explaining why we would be much more efficient if we had a truck. Secondly, I want to thank all of you for the support we have received. Sometimes the little things make a huge long-term solution. The storm on April 16th showed why it’s important to clean out your culverts. A lot of people downstream, of people who didn’t clean their culverts, received millions of gallons of water, gravel, leaves, etc. and cost people lots of time, energy and money cleaning the unnecessary mess and damage. So once again, PLEASE keep your culverts clean. We have started our paving, mowing and grading. Looks like another good year. Teresa Taylor of Salty Dog Pottery (www.saltydogpottery.com) in Barnstead and Val Long, an encaustic artist in Epsom, will be in an exhibit that will open with a reception on Friday, April 27th from 6:30-8:30 pm. 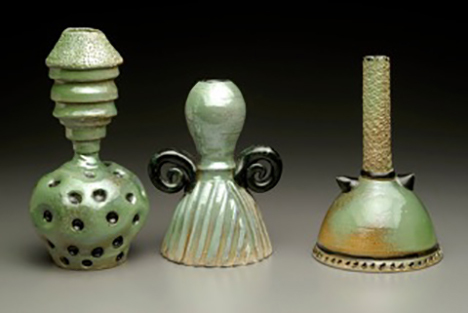 Teresa will be exhibiting SMALL OBJECTS: ceramic pieces inspired by the natural world, in the cases at the library. Val will be exhibiting Encaustic paintings, titled ABSTRACTION. Come meet both artists, Teresa and Val, and see their diverse pieces at the opening reception. The exhibit runs April 28- June 9, 2018; Monday-Thursday 10 am-7 pm, Saturday 10 am-1pm. Epsom Public Library, 1606 Dover Road, Epsom, NH.